« Do You Know What the B&B Industry’s Competition is Doing? After Peter’s recent posting about the simple joys of sitting on the porch and the numerous comments it elicited, I thought I would share a brief ‘reading’ with you…one I wished I had written, but will be pleased to share with you instead. A couple of weeks ago, Jan and I went to the wedding of Kate Lindblom, the daughter of Innkeepers Sarah and Erik Lindblom of The Captain Jefferds Inn in Kennebunkport. It was a beautiful day for the wedding, Kate was a lovely Bride and Sam the handsome Groom, and it was so nice to spend the afternoon with friends and colleagues in a wonderfully non-business environment. 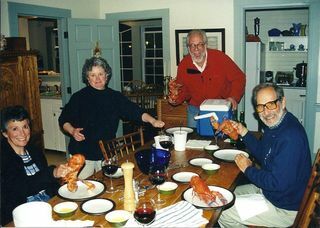 There was an abundance of food and wine after the ceremony and we were all enjoying an early summer afternoon in Maine. There were toasts from the best man, the maid of honor, and another from Kate and Sam’s friend, Finn MacDonald. Finn is one of the Owner/Innkeepers at our old inn, the Captain Fairfield Inn. Finn’s toast brought a thoughtful hush over the crowd with its simple elegance and heartfelt meanings. With Finn’s permission, I would like to share it with you now…and share a photo of us with family at our Good Table when we were Innkeepers. Beginning tonight, let there always be a good table for you both to gather around. Let it host friends and family. Let it present birthday cakes, Thanksgiving Turkey, everyday meals, leftovers, your new best efforts and your burnt best efforts. Let milk spill. Let fists pound. Let hands unite in prayer. Let the wax of candles drip. Let the rings of beer bottles multiply. Let the day’s trivial gossip and life’s great questions speak freely. Let others bore you to tears. Let the sturdy legs and a strong surface absorb frustration, pain, uncertainty, and fear. Let it be the stage to let it all out on…then, let it be the foundation to build from. Let date nights, late nights, anniversaries, picnics, pizza, salad bowls, super bowls, chowda, chili, ice cream and cake bring you together. Let your focus, for just a moment, be on the person next to you or across from you. Let the rest of life wait until you’re finished. Let this table take some responsibility off of your love for each other. Let there always be a good table in your life. No matter what distance or disturbance may exist in your life, let the table be a bridge or a barrier. Let it be a functional bond. Let that Good Table bring you both together. Thanks Finn for allowing me to share your words. My wish to you all is that as you charge through your busy days as Innkeepers, taking care of your guests and your business, that you allow time into your day to take care of yourselves and to enjoy the ‘Good Table’ in your life. This entry was posted on Thursday, June 17th, 2010 at 9:05 am	and is filed under Food & Beverage, Innkeeping Business. You can follow any responses to this entry through the RSS 2.0 feed. Both comments and pings are currently closed. DH’s uncle always said the spots on a table cloth are good as they tell the tale of many good times and meals at that table. Thanks so much Rick! Reading this caused a flood of warm memories to rush over me. Memories of my mom who is long gone and caring family and friends that gather around our table for all occasions. With your permission and that of your friend Finn, I will keep this to share with my family.